Euromoney Institutional Investor PLC, the international online information and events group, achieved a record adjusted profit before tax of £106.8m for the year to September 30 2012, against £92.7m in 2011. 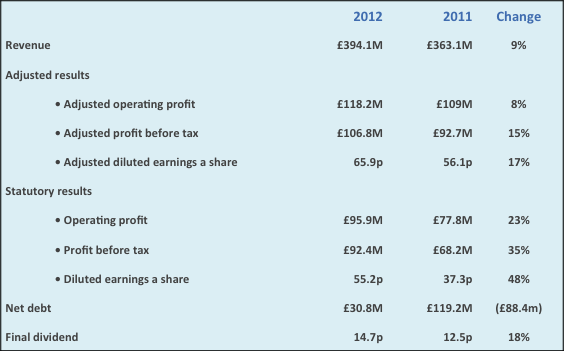 Adjusted diluted earnings a share were 65.9p (2011: 56.1p). The directors recommend an 18% increase in the final dividend to 14.75p, giving a total for the year of 21.75p (2011: 18.75p), to be paid to shareholders on February 14 2013. Total revenues for the year increased by 9% to £394.1m. Underlying revenues, excluding acquisitions, increased by 3%. The acquisition of Ned Davis Research (NDR) in August 2011 has helped increase the proportion of revenues generated from subscriptions to more than 50% for the first time. Headline subscription revenues increased by 17% to £199.7m and underlying subscriptions, excluding NDR, by 5%. The adjusted operating margin was unchanged at 30%. Costs, particularly headcount, have remained tightly controlled throughout the year. At the same time, the group has increased its investment in technology and new products as part of its online growth strategy. Net debt at September 30 was £30.8m compared with £88.5m at March 31 and £119.2m at September 30 2011. In the absence of any significant acquisitions, net debt has fallen by £88.4m since the start of the year, reflecting the group’s strong cash flows and an operating cash conversion rate* in excess of 100%. The group’s net debt is now at its lowest level for more than a decade and its robust balance sheet provides plenty of headroom for the group to pursue its acquisition strategy. As highlighted in previous trading updates, market conditions became noticeably tougher from June. The uncertainty over Europe remains, as does a solution to the pending US fiscal cliff. Meanwhile global financial institutions face the combined challenges of difficult markets, increased capital requirements and a tougher regulatory environment. Inevitably they have responded by cutting costs, particularly people, and exiting some parts of their business. However, the outlook for emerging markets, which account for more than a third of the group’s revenues, is more positive. The board expects this challenging trading background to continue at least into the early part of 2013.